Now begins my second half of of 2010 Style Challenge Review! These outfits are really bringing back great memories! I can't say I would wear those socks with those wood sandals (top left) again, but I'm glad I tried something different. And I did find a way to wear socks and sandals that looks quite fab (bottom middle). Around this time I started trying to dig into my closet and wear items worn just once before, like my jumpsuit, my long black vest and my too big Oh Deer heels (still too big, dangit!). I definitely feel like I mastered necklaces at this point, ha! As the summer wound down, I drew a lot of inspiration from Lucky Magazine and celebrity paparazzi shots. 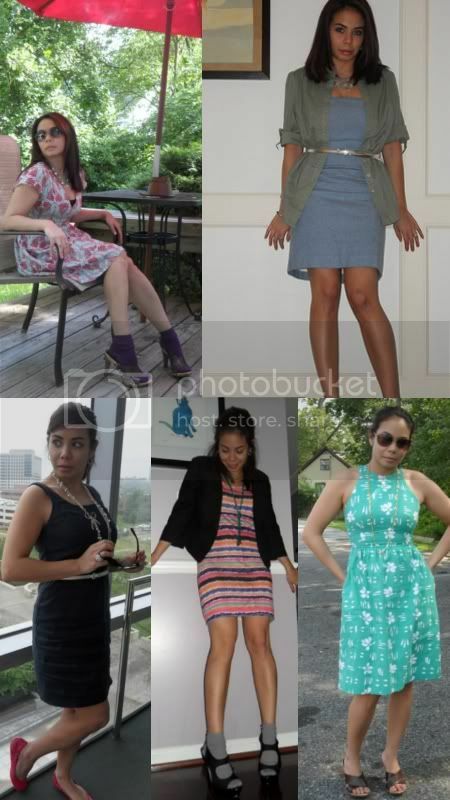 I also got to participate in the Ann Taylor Little Black Dress Challenge, which was super fun! Next up was fashion week! Looking chic, yet comfortable can be very difficult when you're on your feet for eight hours a day, but I think I did a decent job, particularly since I got sick halfway through! Once it started to get cool out, I focused on not getting lazy. You know how it is, once the days drop below 65 degrees all you want to wear are sweatpants and slipper socks. But I managed to persevere! Some of my last outfits of the year!!! The top two were take by the Art of Accessories, and fueled a sudden, intense need for a new fancy camera. I mean, that quality is just beyond! And my winter white look (bottom left) was one of my favorite outfits of all 2010! Looking back over all my outfits, I'm pretty pleased with how I managed evolve my sense of style, and I hope you all had fun helping me! In 2011, I plan to continue to post outfits with my new camera (YAY). I hope to develop my aesthetic a little more and I still need to master layering, dammit!